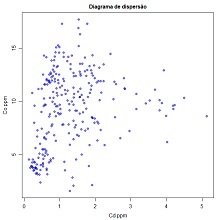 Plot a scatterplot of two quantitative variables. 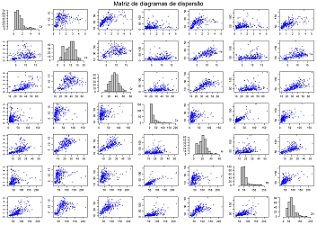 Plot a matrix of scatterplots of several quantitative variables. Histograms are plotted in the diagonal of the matrix. 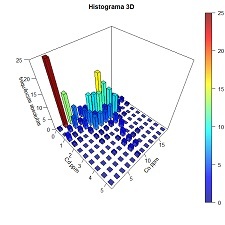 Compute a contingency table for equal size intervals of two quantitative variables (absolute frequencies) and plot a 3D histogram. Plot a QQ plot of two quantitative variables. 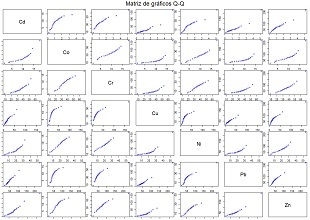 Plot a matrix of QQ plots of several quantitative variables. 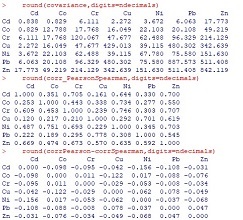 For a set of quantitative variables, compute and display a matrix of covariance, a matrix of correlations (Pearson in the lower part and Spearman in the upper part) and a matrix of differences between Pearson and Spearman correlation coeficients. 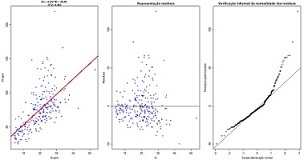 Fit a linear regression (Y=aX+b) between two quantitative variables (left graphic) and display equation and R2, plot residuals vs the primary variable of the regression (central graphic) and plot residuals vs a normal distribution law (informal test for residuals normality). 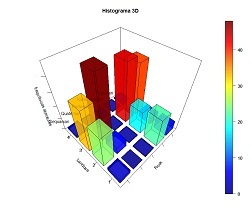 Compute a contingency table for two qualitative variables (relative frequencies) and plot a 3D histogram. Plot a mosaic diagram of two qualitative variables. 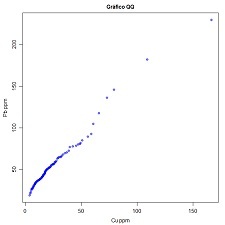 varlistindex <- c(3,4) # index of the two GTD frame quantitative variables. 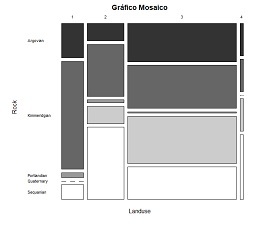 Different order of the qualitative variables generate different graphics. Plot cumulative histograms of several quantitative variables conditional to the modalities of a qualitative variable. 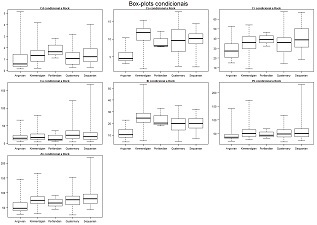 Plot box-plots of several quantitative variables conditional to the modalities of a qualitative variable. 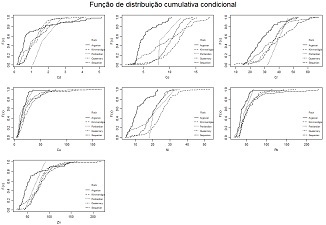 Compute conditional basic statistics (mean, standard deviation and skewness) of a quantitative variable conditional to the modalities of a qualitative variable.